A stunning bangle to give that little extra to any outfit. 9ct white gold and half carat diamonds combine to make this a sparkling addition to your outfit. 9ct white gold half carat diamond bangle. An ideal complement to any gift. 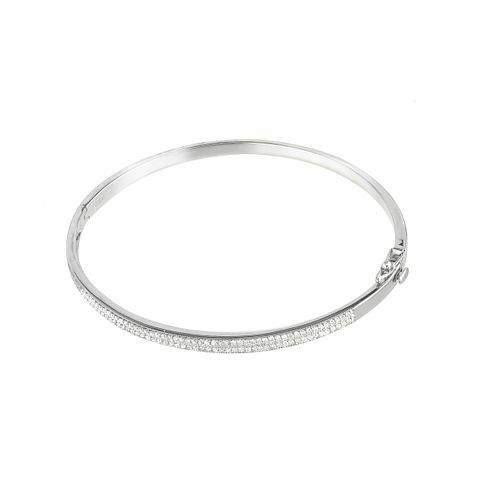 9ct white gold 0.50ct diamond bangle. is rated 3.0 out of 5 by 2. Rated 5 out of 5 by Anonymous from The perfect birthday gift Happy birthday me. I love the bangle, Pave setting is my favourite. Now I want the one carat to wear with it! I must drop some heavy hints to my husband! It has great fastenings with the safety clip so you can fasten it yourself. Treat yourself. Rated 1 out of 5 by Anonymous from a stunning bangle....but A really stunning bangle, I was complimented on the few occasions that I wore it and was delighted to receive it as a gift. Unfortunately despite the safety catch the bangle fell off and was lost. There were no signs of damage it was as evidenced by its loss not secure enough. A real shame!